This is the key to a good game. If you’re a gamer, you may have spent a hefty amount on a graphics card, headphones, and even a mouse, but it would be a shame if you didn’t have the right gaming keyboard to complement your war machine. Some people have their own preferences when it comes to using a keyboard, but they’re usually not as particular as gamers. So, if you are a gamer, please read this article carefully because it could be a matter of life and death… In-game of course. Logitech’s G512 features the Romer-G Tactile mechanical switch, which provides gamers with obvious actuation point they can feel no matter gaming or typing for long hours. The switches are also carefully tested and rated for a 70 million click lifespan to be durable and reliable. With Logitech’s LIGHTSYNC technology, it features customizable lighting driven by games and audio to deliver the most immersive RGB experience ever for avid gamers up to 16.8 million colours. Crafted from the incredibly strong and durable 5052 aluminium-magnesium alloy, it provides a sturdy yet non-slip chassis that creates both minimal and beautiful design. Are you looking for a keyboard to light up your gaming experiences? Try the Razer Huntsman Elite keyboard! With its built-in signature Chroma backlighting, gamers have 16.8 million customizable colour options using Razer’s Synapse software. Adding more fun to that, users can customise their keyboard’s lighting effects in any way they want with the all 4-sides underglow and 38 customisation zones. Other added convenience includes an Ergonomic Wrist Rest at the front of the keyboard, giving users more comfortable gaming experience. Logitech’s G613 is a wireless mechanical gaming keyboard that features both a USB port and Bluetooth connectivity support for computers operating at least Windows 7 and MacOS X 10.10. Powered with only 2 AA batteries, users can expect 18 months of battery life based on user and computing conditions. The keyboard is also connectable to multiple devices with just a push of a button, giving gamers ultimate control and convenience. The K70 Cosair Rapidfire is built for Fortnite players, and it's one of the highest rated gaming keyboards out there in the market. Featuring a 100% anti-ghosting technology, gamers can quickly search for their enemies with ease while being able to register every keypress precisely regardless of how fast in-game actions are. With built-in advanced lighting control, users can also experience vibrant multi-colour backlighting per key. Additionally, there’s a detachable full-length wrist rest on the keyboard for comfortable gaming sessions while users focus on a killing spree for long hours. Razer Ornata offers the all-new mecha-membrane technology that provides the best of both worlds, consisting of comfortable soft cushion alongside mid-height designed keycaps to give gamers crisp tactile clicks with incredible registration speed. This keyboard also allows users to customise astonishing lighting effects, giving them an extensive gameplay experience. Say hello to more precise headshots as Ornata features anti-ghosting capability for up to approximately ten simultaneous key presses. With that, every click registers precisely especially with games on a fast frame per second title. Razer partnered with Microsoft to build the world’s first wireless keyboard and mouse exclusively designed for Xbox One, giving users a new way of gaming on a console. The Razer Turret features a built-in ergonomic wrist rest and a retractable mouse mat for comfort, especially during long gaming hours. This keyboard also has customizable lighting for games to sync to your gameplay, as well as a dedicated Xbox key button to allow users to access Xbox One’s dashboard right away. With just a single charge, this keyboard offers up to approximately 40 hours of battery life. Are you looking for a small-sized keyboard to game comfortably with your small hands? Logitech’s PRO mechanical gaming keyboard features Romer-G Tactile switches that provides users with precise, fast and quiet clicks while maintaining a tactile actuation feel to it. Users can also execute complex commands with just a press of the F1-F12 button macros for a more convenient seamless gameplay. Own a Logitech RGB gaming mouse? The keyboard also features the next-gen RGB lighting that allows you to synchronise both game profiles and lighting with your contents. Having a keyboard with plunger switch technology means that you have the smooth functions of a mechanical one, but with a lower level of noise. This 4S RGB keyboard comes with adjustable LED lighting effects as well as 26 anti-ghosting keys, so you wouldn’t need to worry about not being able to select your favourite combo keys. This affordable gaming keyboard is indeed a great value for money. Want a gaming keyboard with LED backlighting to accompany your long gameplays? The AULA RGB keyboard will surely lift the spirit of any game with its beautiful colours coming from under the keys. Its metal panel and design give confidence and assurance to the durability of this product. With a lifespan of up to 60 million keystrokes and other features like auxiliary adjustable brackets to tilt the keyboard to a perfect angle, you are guaranteed a carefree and comfortable gaming session. Play with greater satisfaction because the Cooler Master MasterKeys Lite is indeed a force to be reckoned with. This keyboard is still as good as those with a mechanical switch, even coming with the right amount of noise during those clicks to give you the right sensation for every press. A significant advantage of this keyboard is that it is splash-resistant, so you need not worry about having beverages around while you game. Other features in this RGB keyboard includes anti-ghosting for up to 26 keys and dedicated media hot-keys. If you want to customise your keycaps, you will be pleased to know that this product allows you to use any 3rd party or 3D printed keycaps so long as they are also compatible with Cherry MX keycaps. Alienware’s design brings users closer to the world of immersive gaming with its impressive, vibrant lighting effects. Speed, control and accuracy in gaming have never been more accurate thanks to their anti-ghosting and N-key rollover built into the mechanical switches. Aside from all of those, this keyboard consists of 50 million keyboard life cycle in which means it is made to lasts longer. One can also maximise their comfort with three adjustable feet angles and an included palm rest attached magnetically. 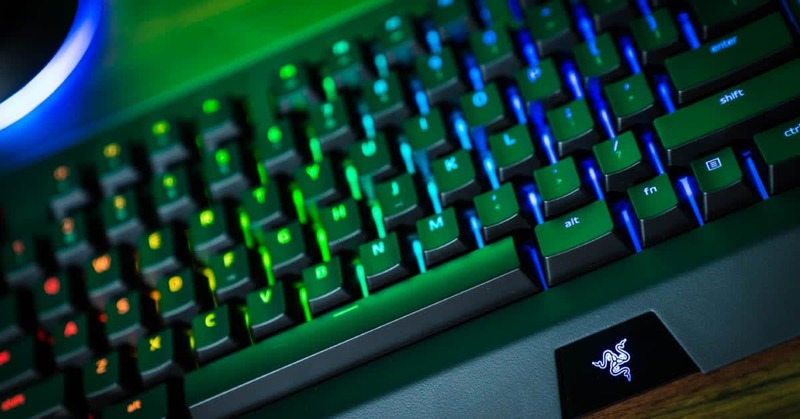 Razer’s Blackwidow Ultimate is the mother of all Razer keyboards, featuring Razer’s signature clicky sounds from each key. Feel the authentic tactile clicks and the fast response from the keyboard as you game in high frames per second. To everyone’s delight, this is also one of Razer’s very first water and dust resistant keyboard with an IP54 certified. You can now stop worrying about spilt drinks affecting your levelling up moments.